Dr. E. Blake Peurifoy is a native of Cabarrus County and worked at Cabarrus Animal Hospital while in high school. Dr. Peurifoy graduated from NC State University in 1995 with his B.S. degree in Animal Science. He earned his Doctor of Veterinary Medicine degree from Ross University, St. Kitts WI in 2002. Dr. Blake then went on to complete an advanced rotating general internship at Boston Road Animal Hospital in Massachusetts, followed by completing a surgical internship program at Affiliated Veterinary Specialist in Orange Park/Jacksonville, FL in 2005. In 2006, Dr. Peurifoy moved back to Concord, with his family and rejoined the Cabarrus Animal Hospital family where he has further developed his special interest in surgery and wound management. 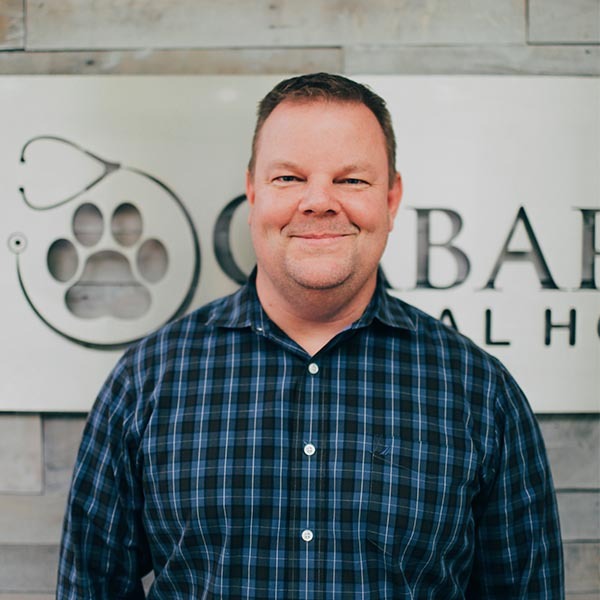 In 2014 Dr. Peurifoy, along with his business partner, Michael Robinson, purchased Cabarrus Animal Hospital and are striving build a practice of excellence for both patients and clients. “Dr. P,” as many know him, is married to Stephanie Peurifoy, and they have a daughter, McKenzie, and son, Cole. Away from the clinic, Dr. Peurifoy enjoys time spent with family and friends and anything involving water, including boating, skiing, swimming, fishing and scuba.